The New Easy to Master Dungeons & Dragons was my first exposure to the D&D basic line. At the time, I was already quite into Second Edition (my gateway edition), so I’m not sure why I even had a copy of this. Maybe it was a present or something? In any case, it ended up being quite educational for someone who had never seen race-as-class or an unarmored AC of 9 before. I ultimately picked up a copy of the Rules Cyclopedia too, for the full experience. 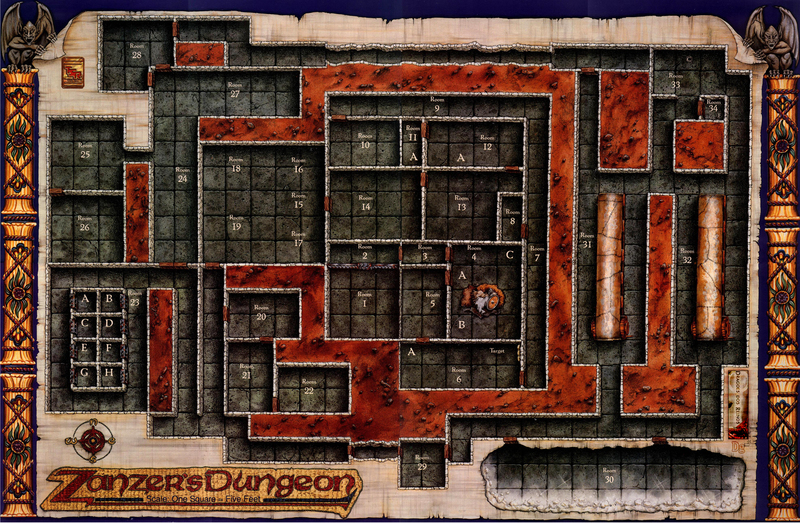 Check out Zanzer’s Dungeon (from this site that is in a language I don’t understand). This was the map of the dungeon for the included beginning adventure. Looking at that map now, it’s a rather wacky design: basically a big spiral leading in to the prison cell where the (captured) PCs are expected to begin. Not much naturalism there. Also, I don’t remember where the actual entrance was supposed to be. Is there a staircase I am missing or something? Maybe it was the concealed door in room 33? The new construction on the east side was started by a greedy merchant who either does not hold the old legends in high esteem, or does not care as long as he extracts the mineral wealth. Further adventure hooks are left as an exercise for the reader. This entry was posted in Uncategorized on January 22, 2012 by Necropraxis. I like Zanzer’s dungeon because it’s part of the lineage of the Basic Set Sample Dungeons. However, I haven’t read it that closely, particularly because it’s spread out on a bunch of cards. What I like from that set are the fold-up paper minis. I’ve been using them in our game to fill out monsters in our combats. We use plastic minis for the PCs & it helps to keep track of which are which. I just got this (in the shrinkwrap!) 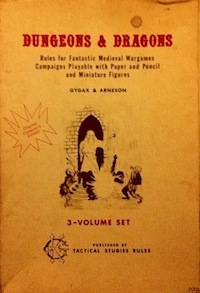 for a few bucks after becoming interested in and researching late ‘Classic’ D&D! The internal contents changed slightly: the card format for the introductory adventure was jettisoned, incorporating the text into the rule book as discrete sections, thereby bringing the page count up to 128(Coincidentally, this meant the DM’s screen will stand up now! :-D); the cautionary ‘read this first’ notesheet was done away with; the wall poster of the box art is no longer included. For more comprehensive(and likely completely accurate) info, check the Acaeum, Tome of Treasures, Dragonsfoot, Original D&D discussion boards, TSR Archive, and the like! Intriguing post on Zanzer’s Dungeon, and its possible usefulness! Interesting, thanks for the added info. I’ve never seen this smaller relative of the “new, easy to master” box. Moving the info on the cards into the ref book seems like a smart move. Are the folding monster tokens and the dungeon “gameboard” map included as well? Good info, velaran. BTW, you should start your own blog! I haven’t seen the 1994 set, but I’ve heard complaints that all of the dumbed-down intro stuff (from the cards in the earlier set) is in the booklet, making the rulebook alot longer than needed. Hokey smokes! That’s an edition that I completely missed back in the day (actually, I may have seen it, but I wasn’t aware of the variations going on, and so dismissed each of the various releases), and wasn’t even aware of until now. Is it any different than the Cyclopedia (or BECMI), or is it just a different presentation of those rules? It’s basically a Basic Set for the Rules Cyclopedia, though the editors were different (Brown & Denning vs Allston). IIRC, it was published around the same time and has essentially the same rules, but covers levels 1-5 (more than previous Basic Sets). I actually sold the rule book and just kept the other contents of the set. The Sample Dungeon is described on tutorial cards rather than being in the rulebook. The map Brendan linked above is poster-sized and intended to be used with the fold-up minis. I don’t have a copy of this anymore, so I’m not sure if there are any rules differences. I’m guessing not. I think by the point of this release, TSR was more interested in providing a uniform play experience within a single product line.